Boutique hotels are plentiful in Paris, and finding the right one for your budget can take some searching. These independently run hotels offer an enticing alternative to the larger, often more expensive international chain hotels. Paris has gained a reputation as the world’s most romantic city, but also for an occasionally stuffy or elitist attitude. By finding the friendliest lodging, travelers can avoid the attitude and maximize their experience of romantic charm. Often, these smaller hotels have been family businesses for many generations and provide a more personalized and casual atmosphere for guests. It is possible to find Paris hotels that are charmingly French and friendly — if you know where to look. Here are seven of the friendliest boutique hotels in the City of Light. These hotels are also friendly for your pocketbook and will cost you under $200 per night during most seasons. The renowned poet Edna St. Vincent Millay stayed here in 1921 when she was a foreign correspondent for Vanity Fair. She favored the hotel for its affordability and historical appeal. Today’s guests are greeted with the same combination of practicality and charm that so enticed the famous poet nearly a century ago. The Hotel des Saints-Peres is in the bohemian Left Bank of Paris, still an international beacon for artists and writers. One of the hotel’s suites features a 17th-century fresco on its high ceiling, and all 39 rooms now feature the convenience of Wi-Fi access and mini-bars. It’s rare to find a hotel that exudes historical style but without the pretentious attitude that often accompanies extraordinary design. Hotel Verneuil manages to maintain its friendly, inviting atmosphere while preserving its distinctly Parisian romantic flair. The Verneuil is owned by Parisian hotelier Sylvie de Lattre who meticulously restored the hotel’s handsome 17th-century wooden beams in order to preserve its authentic look. 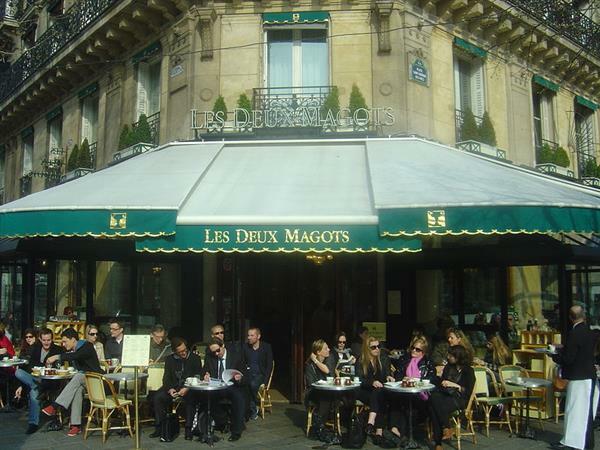 The two closest cafes — the Flore and Deux Magots — are both frequented by locals and rarely by tourists. The St. Gregoire is run by a couple whose passion is to provide old-fashioned personal service. Guests report that the couple truly loves running the hotel and spend their days joyously tending to the needs of guests. Family friendliness exudes in the attention to detail at the St. Gregoire, a hotel that attracts repeat customers because of its comfortable amenities. The couple oversees the small kitchen in the stone cellar where they create rustic-style, home-baked meals and pastries for guests. If you’re seeking a hotel that’s in between a palace hotel and a tiny boutique hotel, the Luxembourg Parc is your spot. The hotel maintains a classic Louis XV style, including fine linens and extravagant bathrooms, but is not quite as decadent as some of the larger hotels. This hotel manages to find a balance between eccentricity and extravagance that appeals to those who favor boutique hotels. One of its stranger features is a “24-hour room service” which mostly involves delivering food directly from local restaurants — a rare service among most smaller hotels. Its name is the French word for “abbey,” true to its origins as a 17th-century abbey. This hotel’s tiny rooms are small enough to be monastic cells, and yet they are charmingly quaint. Most rooms offer views of a medieval church, St. Sulpice. Hotel de l’Abbaye is decorated in phenomenally bright floral fabrics, amplifying the warm and comforting mood. The quaint lodgings here provide a convenient escape from the hustle and bustle of modern Paris with its original cobbled patio and leafy green gardens. Stay here and you’ll have Paris at your doorstep and a contemplative sanctuary while you sleep. The Buci Latin is the essence of quirky, artistic decor. The hotel’s facade is constructed to resemble a flying saucer, and its main staircase features a gigantic graffiti mural. The lobby is buzzing with busy abstract wall paintings, and zebra stripes are a common fabric motif throughout the rooms. While its wacky look does not appeal to everyone, the hotel strives to maintain a warm and comfortable atmosphere and doesn’t veer into the pretentious attitude that sometimes accompanies the art world. During fashion week, this hotel is a favorite of editors, photographers and designers who favor a more low-key hotel experience. This 34-room hotel resembles an 18th-century townhouse with its dazzling pleated fabric-covered salon and pansy-filled gardens. The staff wear stylish uniforms but maintain a more casual approach to guest service. The famed model and actress Lauren Bacall opted to stay at the Duc de St. Simon as often as possible during her stays in Paris. Students of design frequent the hotel to take note of its unique interior décor, which focuses on folded and molded textiles. While this hotel is fashion forward, it retains the vibe of a boutique hotel. You’ll know you’ve found the right boutique hotel when you go to sleep smiling and wake up the same way. About the Author: Samantha Jansen is a travel and tourism writer based in New York City.